I traveled and fished a lot in 2016, so much so that I may have been burned out a bit in 2017. This year, although I did fish in Florida, New Hampshire (twice), and a roadtrip to North Carolina and Virginia, the desire to species hunt was waning. 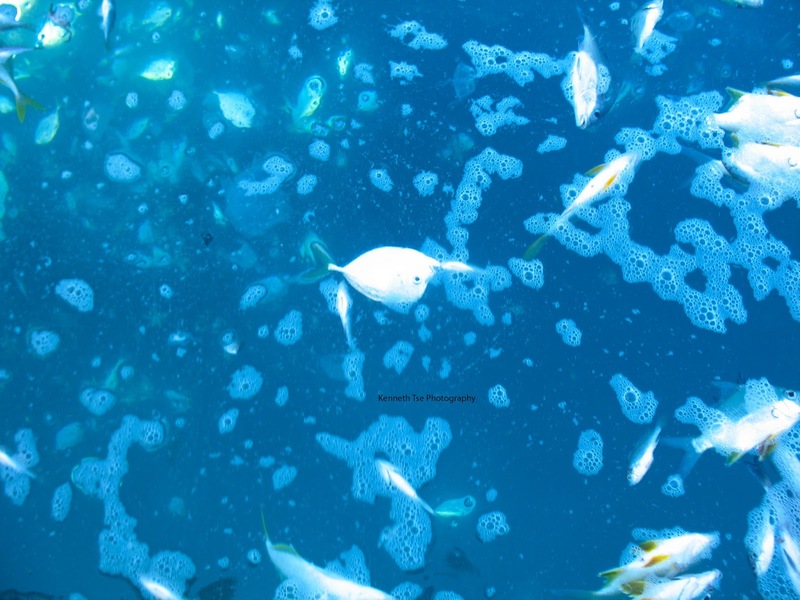 For those familiar with this blog, you saw very little update since...Indonesia last November. In addition to other obligations and happenings in life, I simply took species fishing rather nonchalantly this year. This summer, I was supposed to visit Mike Bryant in Yellowknife to fish for Inconnu. But with Mike looking for a new home for his family and a late decision on my part, I was not able to find available flights north. I learned that George and Josh were planning a trip to Mazatlan. Ben was also in conversation but his move to California restricted his ability to take a trip. So I decided to spend my Yellowknife trip budget on Mazatlan instead. Up until the day of departure, I had a disinterest to travel. There were simply too many other happenings at home that kept my mind occupied. 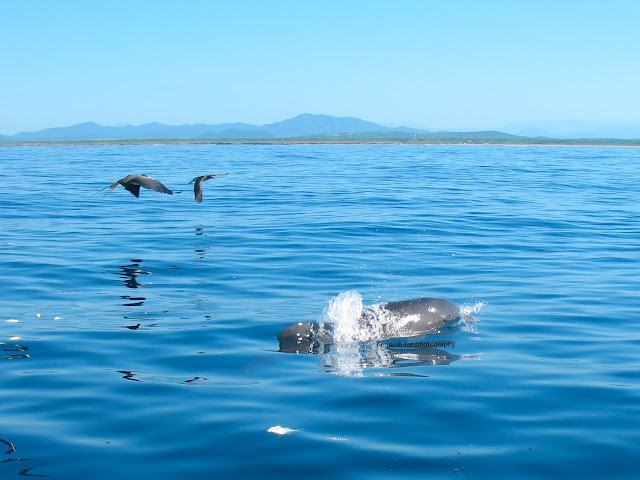 But once I step foot in Mazatlan airport and felt the hot humid air, the sense of adventure returned. Our plan for the first day involved fishing some wrecks and reefs for three main targets: Orangemouth Weakfish, White Snook and Blackblotch Pompano. George had already been in Mazatlan for a week and fished 4 days. He reported that the water was warmer than usual. The big blue shrimp has not arrived and thus our target were sparse. The Blackblotch Pompano seemed to be the more common of the three at the moment. But we were hoping that cooler water would arrive during our stay and bring in more fish. Our captain, Captain C, knows these area well. We fished each spot quickly with big live shrimp. If there was no bite within the first 10 minutes, or if the current doesn't seem right, he would suggest to move to another spot. And so we were on the second spot of the day when we soaked our live shrimp for a few minutes and caught a couple of Pacific Jack Crevalle. Then it was silent and Captain C said "no customers". Since we were species anglers (and Captain C knew this well), he suggested that we should try to fish small chunks of shrimp on a high-low rig for other possible species on the wreck. I had just dropped the shrimp chunks for a couple of minutes when the rod suddenly arched downward. It was a fairly substantial fish that put up a few good runs. Perhaps it was a big Snapper, or maybe it was a big Finescale Triggerfish? After some tense moments, we finally had colour. Everyone was surprised that the Orangemouth Weakfish passed up three big live shrimp in favour of a small chunk of shrimp. 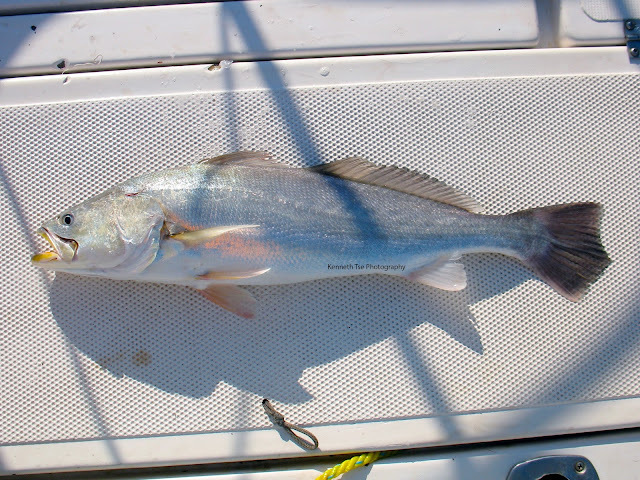 That spot didn't give up any other Weakfish and we moved on. We fished a few more wrecks and decided to make a longer move north to a reef that was known to host some Jeweled Moray and Mexican Barred Snapper. Both species were high on my target list since I missed catching these two on the last trip. 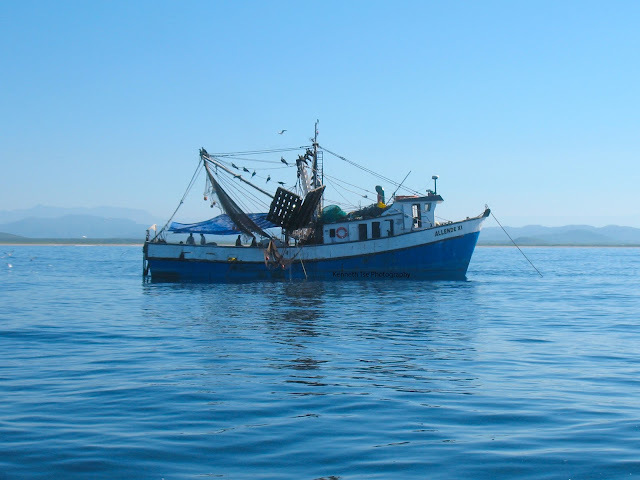 Before we got to the reef, we spotted a shrimp boat that was on anchor. 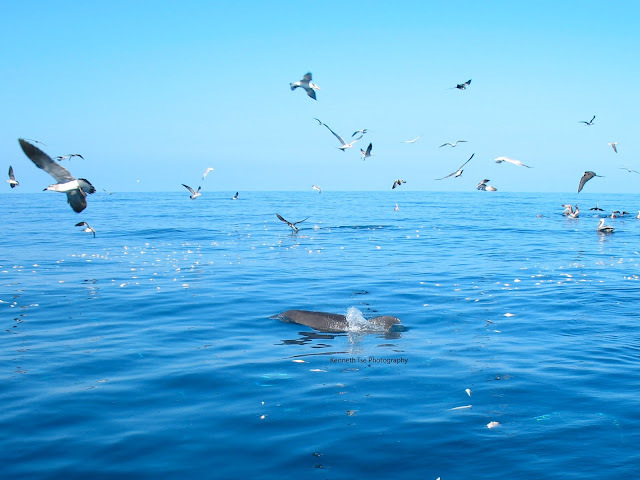 The boat has just dumped a huge amount of bycatch and it attracted all the local wildlife. The bycatch consisted of mainly Shortnose Mojarra and Pacific Moonfish. Both of which would be lifers. There was even a Jewel Moray that was alive...but it likely would not have bite any baited hooks since it was still recovering from the ordeal. We got a bag of shrimp heads from the shrimp boat. They make really good bait. The fishing was steady and we were catching some Grunt species, a few Finescale Triggerfish and a few Spotted Rose Snapper. Then...something else different was on the line. The fish pulled a little harder and dove a little more determined. 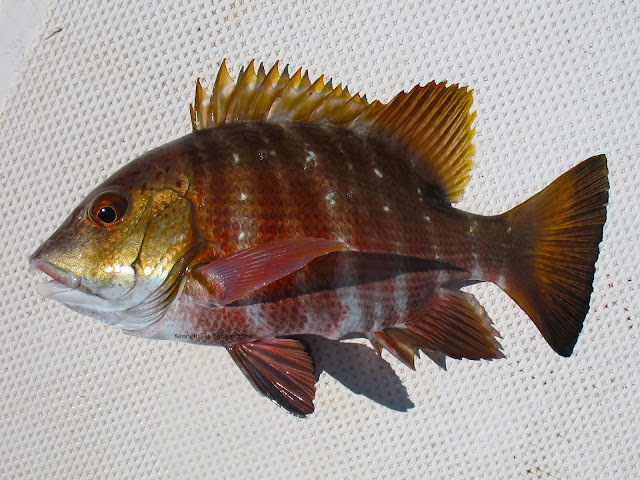 It didn't have the surges and pulses of a big Triggerfish, so I was expecting a larger Snapper. When the fish finally surfaced, I could see the alternating red and white vertical bars and my heart skipped a beat. A smooth swing into the boat and my lifer Mexican Barred Snapper was in my hand! George caught one not long after and we were rooting for Josh to catch one for his lifer. As it often in species fishing the first of the species could take an immense effort and years to achieve...but once you crossed the species off, they jump on the hook often and without intention. And so it was on this day. I would catch 2 more Mexican Barred Snapper and George would catch one more before they stopped biting. It left Josh longing for the species...and I can completely relate to that feeling from two years ago. Even so, Josh was doing quite well on the day with a few species added. We fished the reef until the action slowed down. It was getting toward noon when we headed south again to fish a couple of wrecks closer to part to finish up our day. On the first wreck that we tried, we were soaking the live shrimp for a while and Captain C suggested we should make a small adjustment of the anchor. When he said it was good to drop our baits again, my shrimp had barely arrived on the bottom when it was thumped hard and the rod loaded up. This fish ran with a lot of power and I had to tighten the drag a little a couple of times. After what felt like a few minutes (probably less...it always felt longer), we saw a broad silvery shape circling under the boat. Our mate grabbed the gaff and a missed gaff shot had the fish diving again. 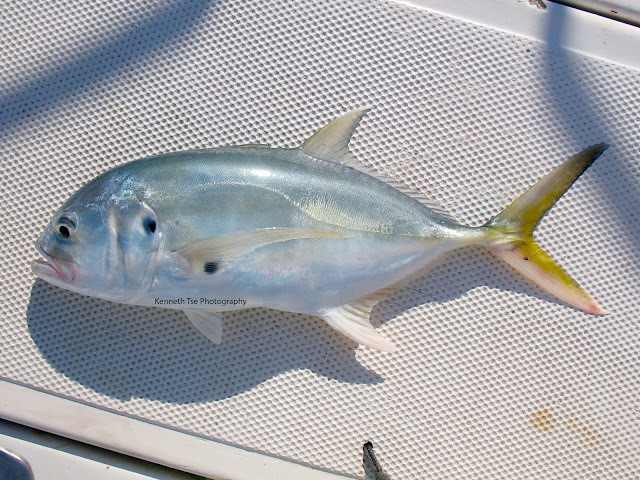 Luckily the second gaff attempt struck and my lifer Blackblotch Pompano was in the boat. This species look very much like their Atlantic cousin (the Permit). 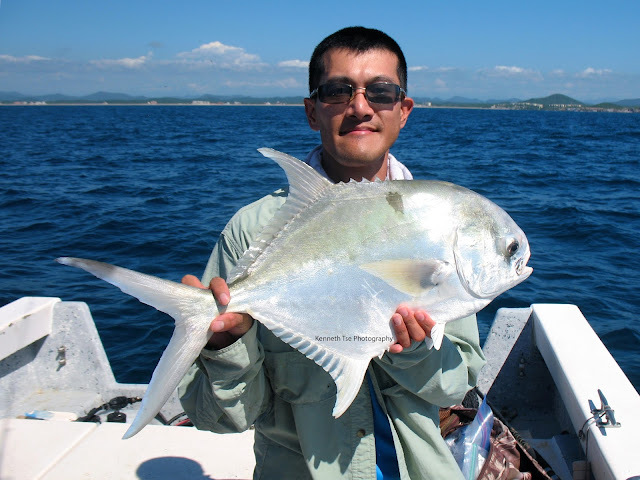 If Permit fight as hard as this species, I look forward to catching a nice Permit in the future. 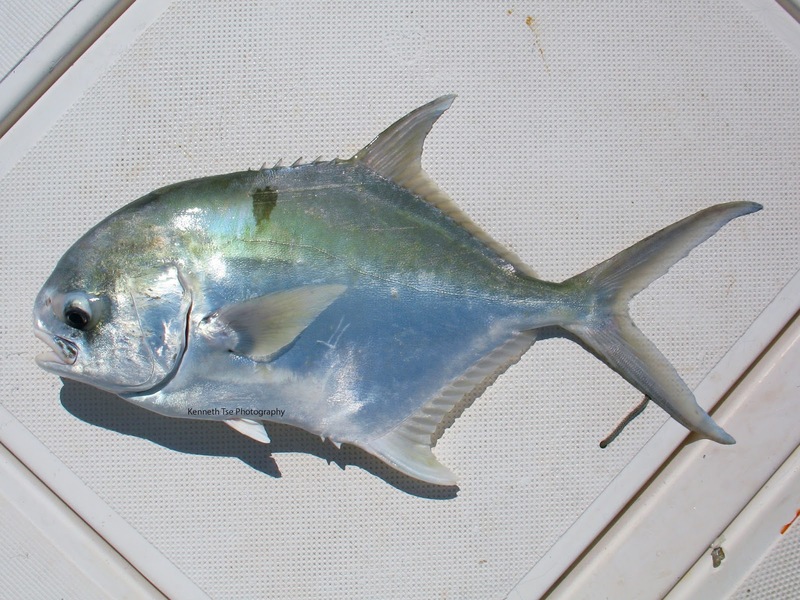 The presence of the Blackblotch Pompano got everyone excited. Usually if there was one there would be others. But On this day, either the others were not in the mood to feed, or the school had moved on. We fished another wreck to end the day and did not find any other Weakfish or Pompano. Instead of doing some shore fishing in the afternoon, we decided to take it easy and visited the hotel pool to cool off. What a treat it was! Even better was the full rack of ribs at Roy's in Cerritos that cost only 130 pesos. 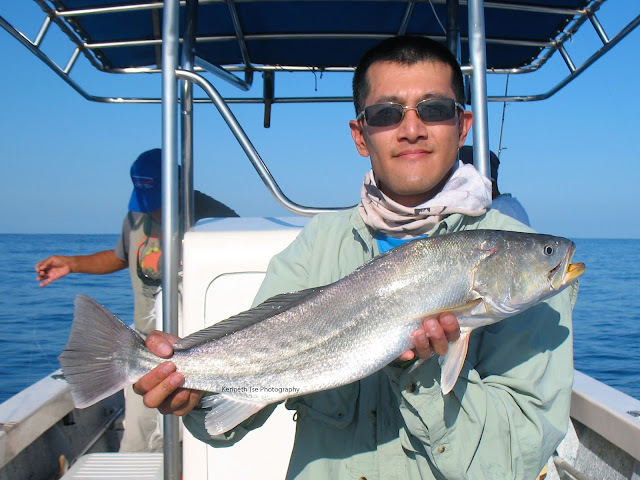 Fishing in Mazatlan is good. But the food is phenomenal! Just like every other trips, I had set some targets for this trip. I was hoping for 15 new species and among these there were 6 lifers that were high on my list. To be able to knock off 3 of the top 6 on the first day was spectacular. And there were 5 more days of fishing to come.